I realize that I have an entirely free Tuesday afternoon and because of my vast professional experience I immediately take it off. 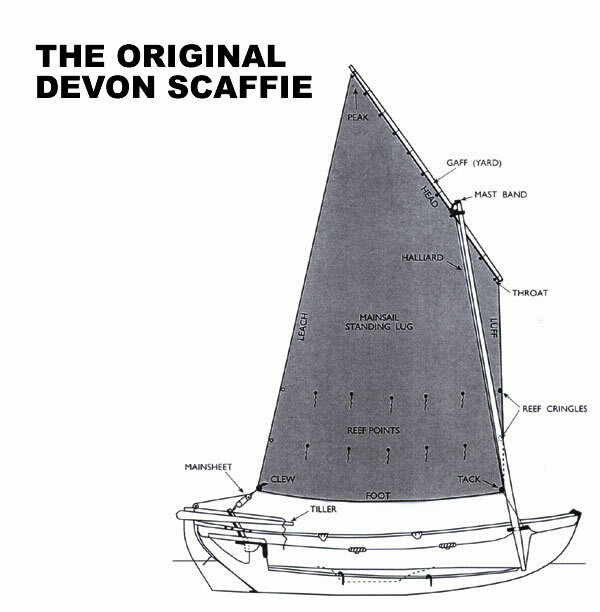 I want to take my sail to a local sailmaker to find out if he can make me a new one. My sail has suffered much from intense UV exposure and I am worried that it will rip. As I unlace the sail from the yard or gaff, which is the length of wood at the top of the sail, I notice that the yard is strangely bent. I try to persuade it into a straightish posture whereupon it breaks in two pieces. I think I must have stood on it at some point. Oh dear, I now have a completely different and unexpected problem. I have to manufacture a new yard. No worries, I take the truckette down to the woodyard of eternal delight that I have recently written about. My brother is moving massive tree trunks around on a forklift but comes to help. I show him the broken yard and he gets it. We have a Japanese conversation. “Do you want mahogany?” “Hmm, says I in mime, I think mahogany might be too heavy.” ” Yeah, you are probably right. Let’s try cedar.” “Cool” I mime by clasping my arms to my sides and shivering. 4 metres of 4×4 cedar. 4 is my lucky number. Has Earth anything to show more fair? When I get home I look carefully at the busted yard and realize that I can probably make a fairly convincing repair. Like a fractured leg the two end of the bones slot back together fairly well. If I can immobilize the leg and strap it up it might grow back together. 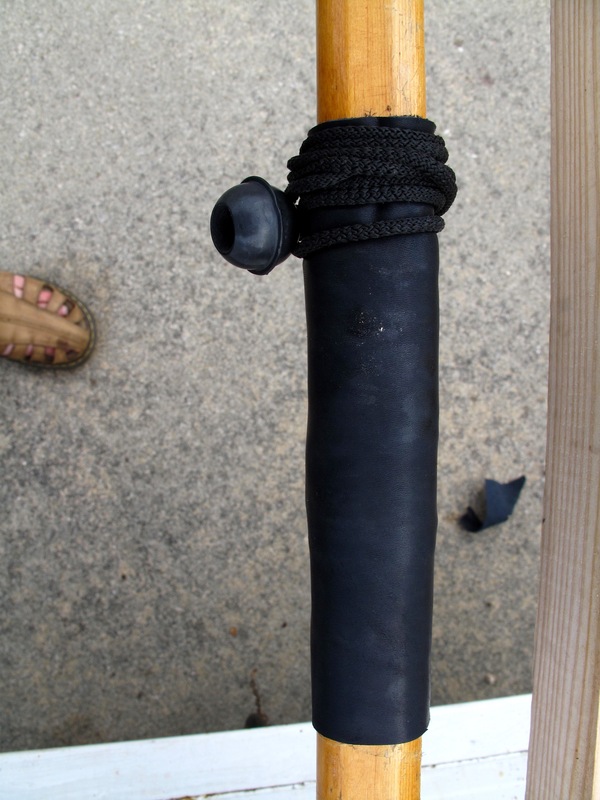 I then apply a pretty good round lashing. 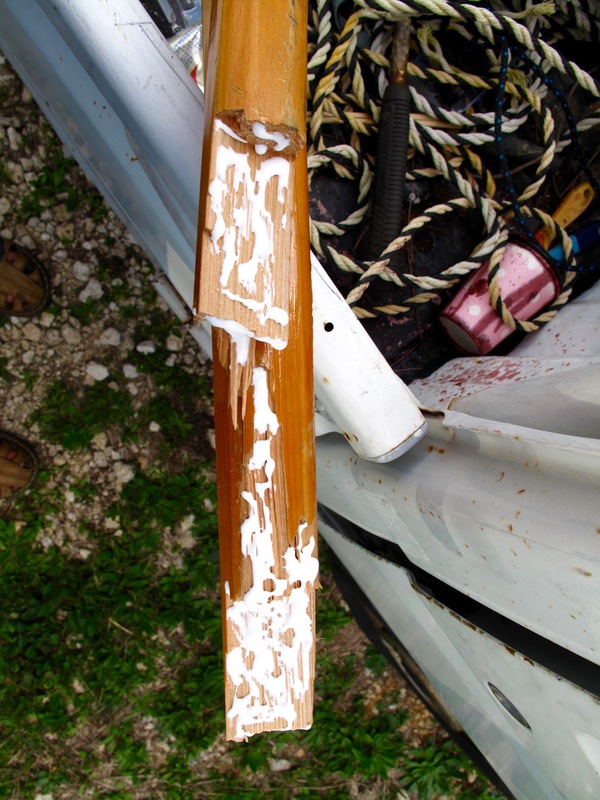 I then drench the lashing in yacht varnish – not sure why. I then cover the whole fracture site in a black leather plaster. I am quite hopeful that this will do the job as I think there is rarely great strain on the yard. That said, I am determined to make a new one just in case. 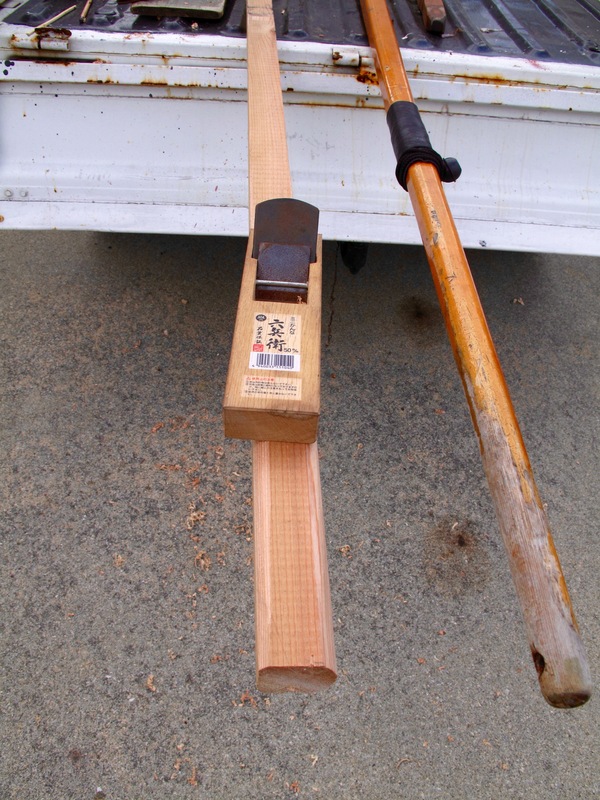 I mean I have a beautiful 4x4x4 length of Okinawan cedar to molest. Who could resist? I unleash my my beloved Japanese plane. 2 Responses to Quelle Gaffe! Love the truckette, what a handy vehicle. 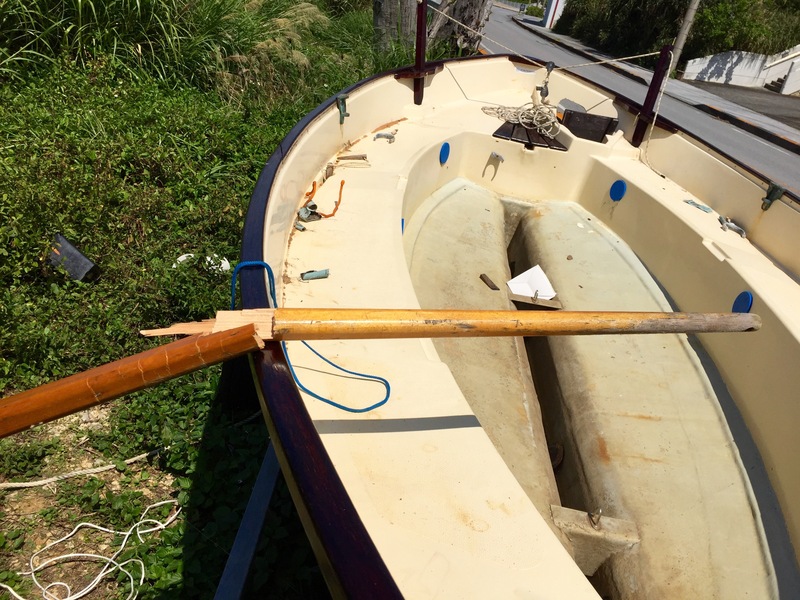 Your recent a Scaffie projects remind me of the universal experience of small boat sailors: addressing one problem inevitably leads to several other problems. About the two wood pieces that are used to elevate the traveler-I believe the whole apparatus is called a “horse.” Who knows why. 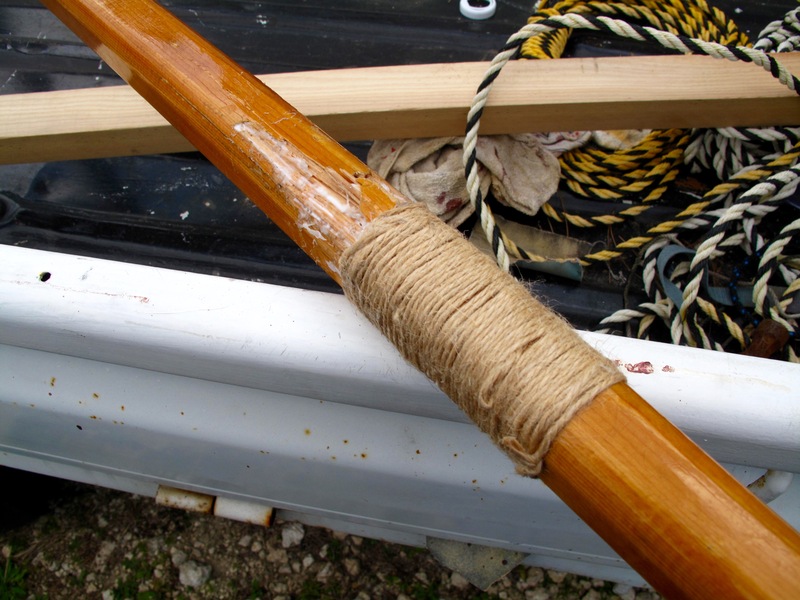 The yard repair looks like it will hold under the typical stresses to which it is subjected until you make a new one. I couldn’t tell if you used epoxy to strengthen the repaired area. It seems to fix almost anything. I hope you get good news from the sailmaker, and I look forward to your upcoming adventures.